GO BOX Storage is located at 2853 Bowers Place, in the southwest corner of Kamloops. If you live in Pinevalley, Dufferin, Aberdeen, or Sahali, you'll find our yard very convenient. Our yard gives good access to Jocko Lake, Inks Lake, Stake Lake, Lodgepole Lake, Lac Le Juene Lake, McConnell Lake and Paska Lake. The GO BOX yard is completely fenced and we live here. There is an office right as you come into the yard so there is someone watching the yard during business hours. GO BOX Storage does have yard space to store your trailer, motorhome, boat, truck or car. The yard is separated into two parts: the lower yard and the upper yard. We don't overload either yard so there's lots of space to maneuver even a very large RV. Many people really like the lower yard because it's completely flat and there's so much room to maneuver around. The upper yard has a very slight grade. 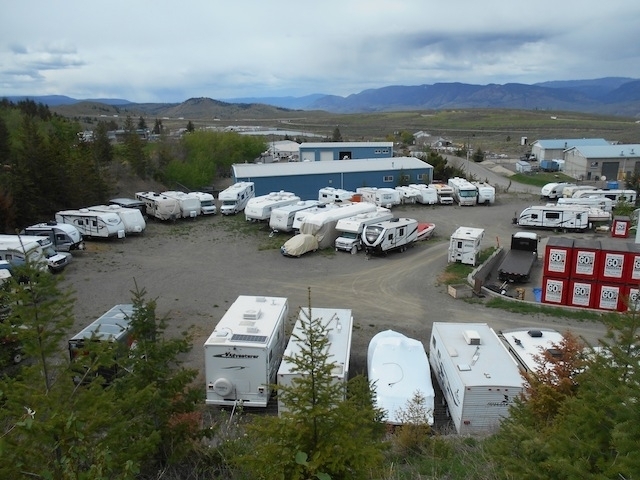 More experienced RV-ers like the upper yard because there's so much space to maneuver, even for the biggest rigs. We have many customers that have stored here for years. Ask us about our pre-payment discounts. We usually have a few spots opening up every month. If you can't get a spot right away, we can put you on our waiting list. For more information about yard storage please call our office or come by for a look around. SOS TIP: GO BOX Storage has secure yard space for your trailer, motorhome, boat, truck or car.